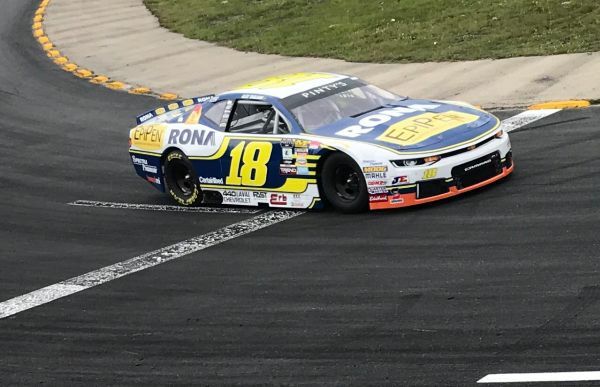 "Tonight, we did not have the car to win, but with a bit of luck, it may have been good enough for a sixth or seventh place finish," said Alex Tagliani on Saturday night following Round 3 of the NASCAR Pinty's Series held at Autodrome Chaudière oval track in Vallée-Junction, Quebec. Unfortunately for the Quebec racecar driver, luck was not on his side. After posting 13th fastest time earlier in the afternoon lone qualifying session, Tagliani quickly moved up past the four cars ahead of him early in the race, and by the 34th lap was battling for eighth place with Ontario driver Kerry Micks. On lap 193, Tagliani's car was sandwiched when the lead cars suddenly slowed down and his EpiPen-RONA-St Hubert Chevrolet Camaro ZL1 was rear-ended and pushed into the car ahead of him. A racing incident caused by no one in particular. Tagliani lost a lap and dropped four positions to 11th place with a smashed up car. "This was not a good day for us." Tagliani said. "The new oval car has a couple of hiccups. We were probably lucky in our first race at Jukasa Motor Speedway when we got the proper set-ups right away. We finished third, but tonight we were off in our settings. The 22 Racing Team has a pretty good idea what to do but we need to test. During a one-day race weekend like Autodrome Chaudière where there is only a one-hour practice session, it is difficult to find solutions to all the little problems. "We are not giving up. The team is seriously thinking of staging a one-day oval track test session prior to our three-race trip to Western Canada in order to find the proper settings for more speed and get rid of the car understeering. "We did however pick up precious points in the championship race tonight and the season is still quite young. We will find the right set ups for this car in order to battle for victory and score maximum points." The Bumper to Bumper 300 - a 300-lap race shortened to 220 laps when rain fell - was won by Andrew Ranger of Roxton Pond, Quebec ahead of L.P. Dumoulin and Donald Theetge. Seventeen drivers started the race with 13 crossing the finish line. Nine cars finished on the lead lap. The race was under full course caution seven times for a total of 41 laps. The Autodrome Chaudière race will air on TSN2 on Sunday, July 8 at 1:00 p.m. ET. In the point's chase, Tagliani remains in seventh place with 105 points, only 23 back from new points leader L.P. Dumoulin of Trois-Rivières, Québec. In 61 NASCAR Pinty's Series starts, Tagliani has six wins, eight poles, 23 top-fives and 39 top-ten finishes. The NASCAR Pinty's Series returns to action on Saturday July 14 at 3:45 p.m. ET as part of the Toronto IndyCar race weekend at Exhibition Place.